The boxes are piling up around our home as I’m getting ready to ring in the festive season and start decorating for Christmas! 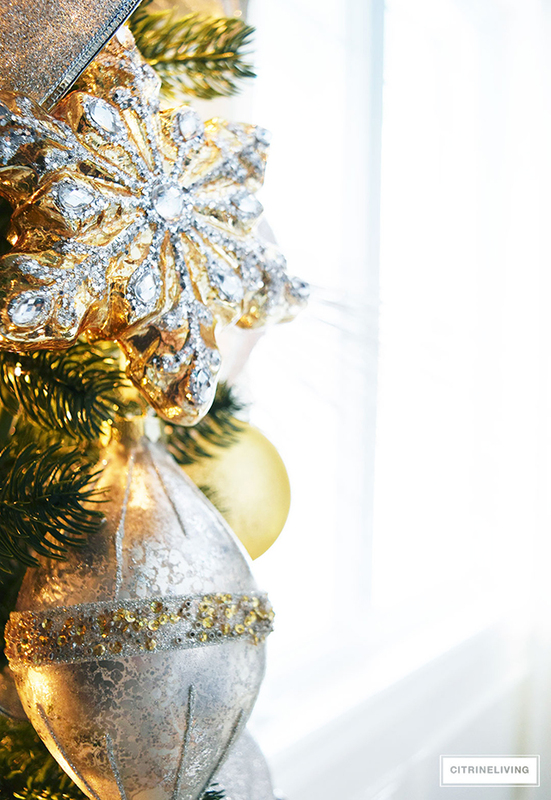 I have a love-hate relationship with decorating for the holidays. There was a time when I would take the first weekend in December and transform our home from top to bottom, real Christmas tree and all, in about 4 days. A lot has changed since I started blogging a few years ago, and this year, eleven days into November, I’m actually late compared to many of my blogging friends! I used to love taking my time and taking it all in, now I can get a little stressed trying to pull it off so early in the year! That said, I promised myself that this year, I’m going to soak it in and truly enjoy it as much as I can. 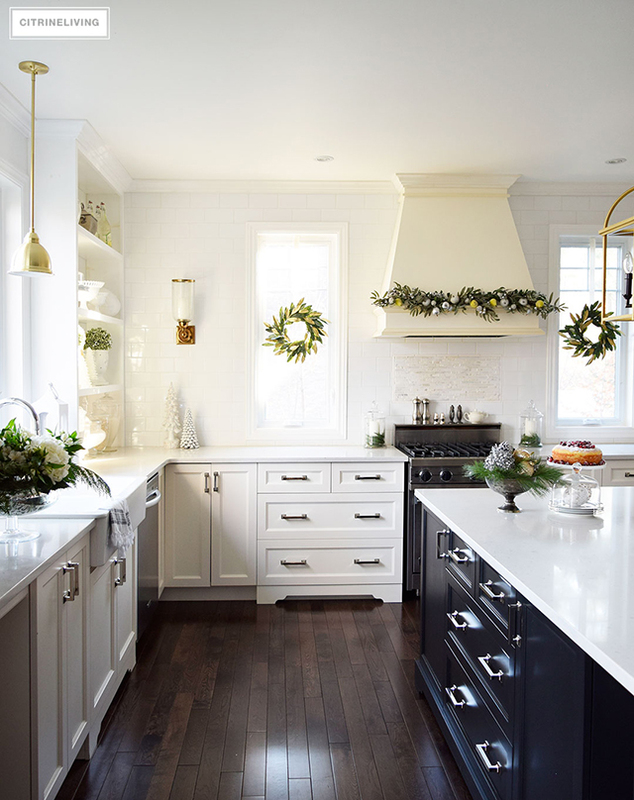 This shot above, from Traditional Home, is so classic, timeless and stunning. I’m taking a few cues from this color palette, but I want to add a little bit more of a contemporary touch in our home. I’m crushing on those gorgeous velvet stockings and if I can manage to grab something similar I most definitely will! 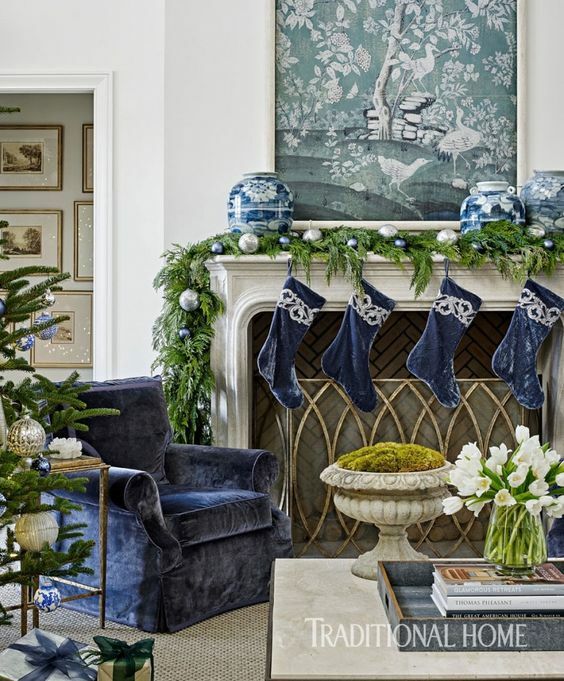 This stunning mantel from Frontgate gives me chills – it literally stopped me in my tracks! This is ginger jar heaven to me and although I wouldn’t copy this exact look, it is inspiring my in a huge way. I’ll be taking some cues from this to decorate our mantel this year. 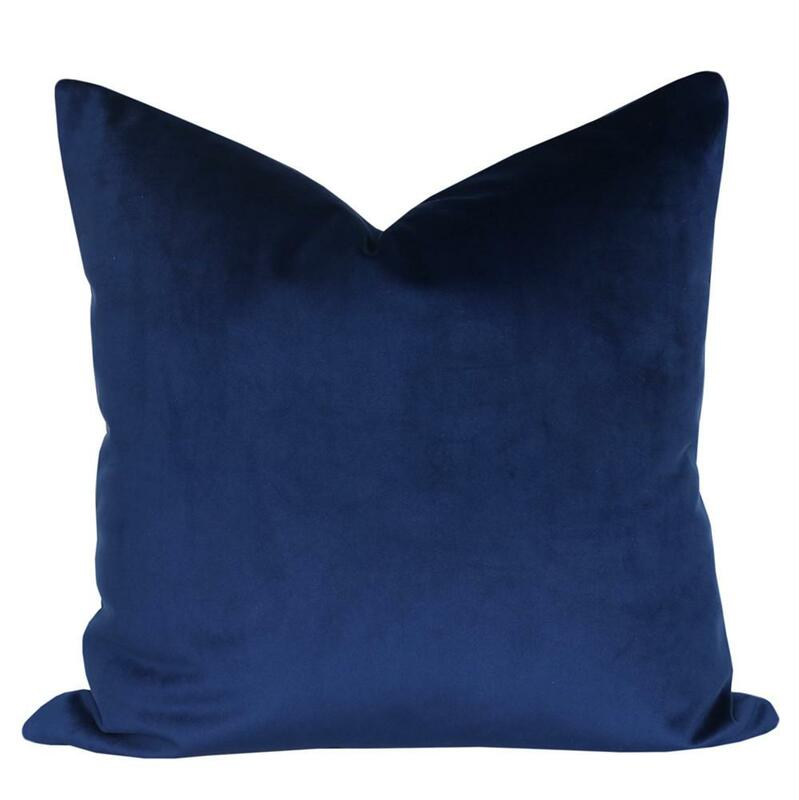 I’ve already received new pillows for our living room and my goal was to create a cool and crisp look this season, that will carry our home over into the winter months as well. 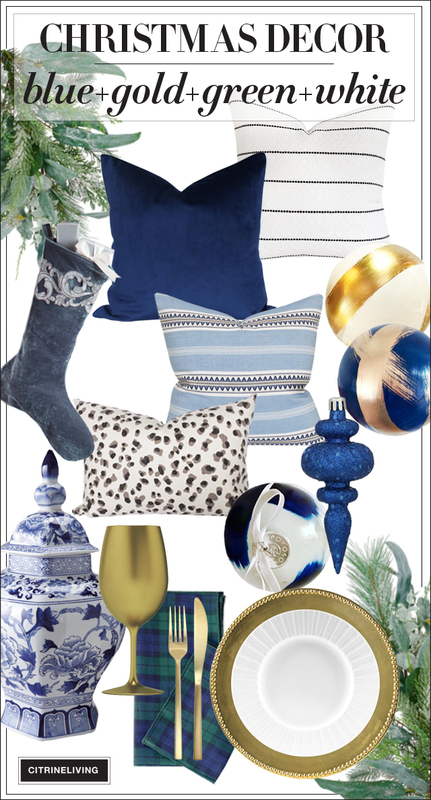 I’ve had a navy + gold combination brewing in my head for a while now, but I couldn’t quite put my finger on how I wanted to execute my vision. I discovered these beautiful hand painted Christmas balls, by an awesome artist, Kristen Tirney (see her work here). Kristen also provided the artwork for our master bathroom makeover (see the One Room Challenge post here), don’t forget to tune in for the full reveal November 16th! While I was contemplating my theme, it came to me that a deep, forest green and navy tartan – black watch tartan – would be the perfect element to tie in somewhere. Just a tiny amount would do the trick, some ribbon and napkins, maybe a throw. 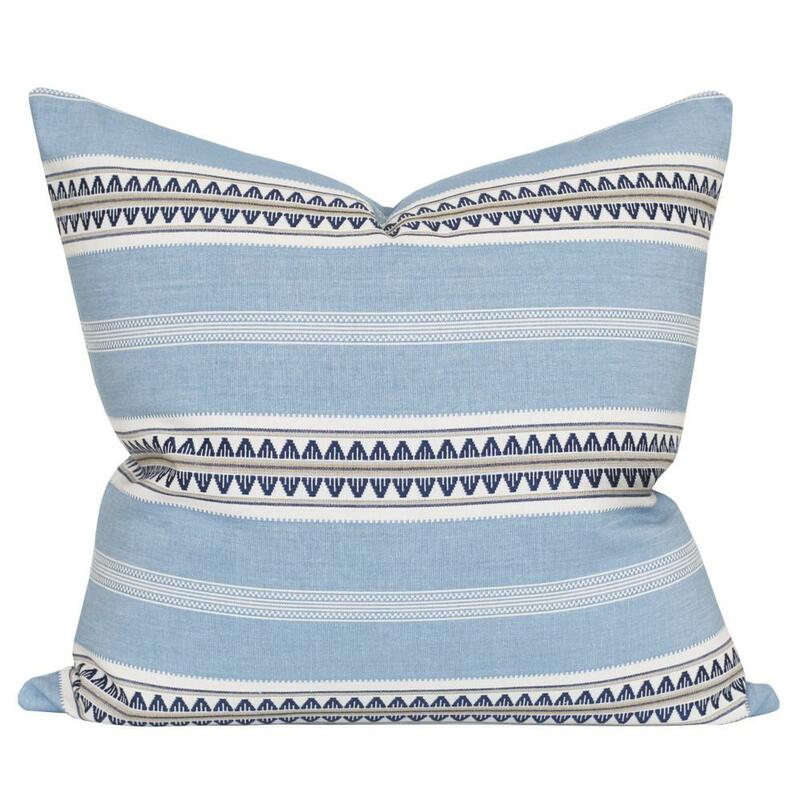 Something more traditional, along with my blue and white collection, to complement the more modern elements. 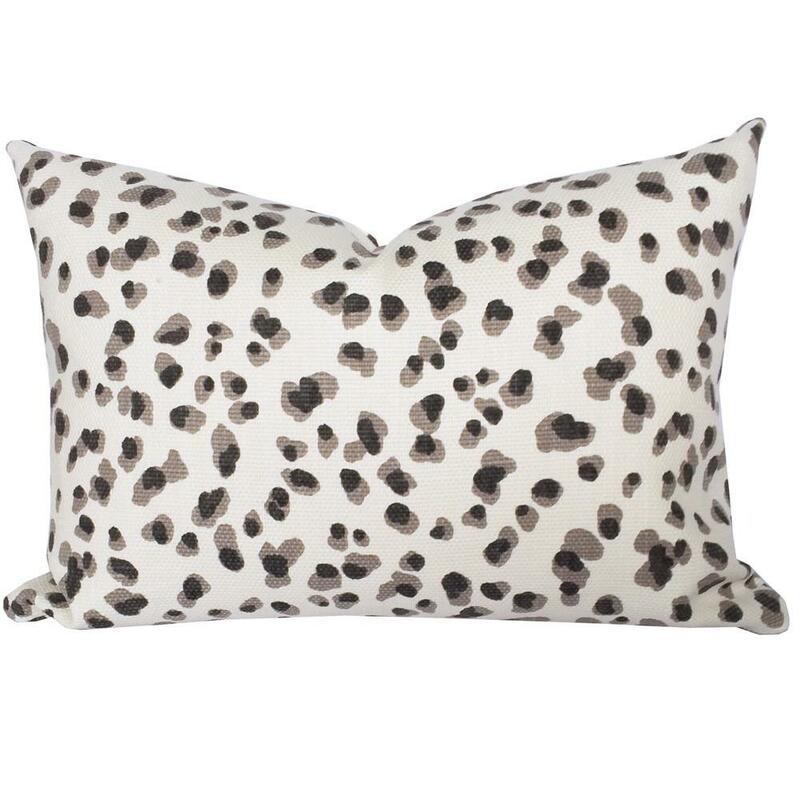 SHOP MY HOLIDAY PILLOWS BELOW! 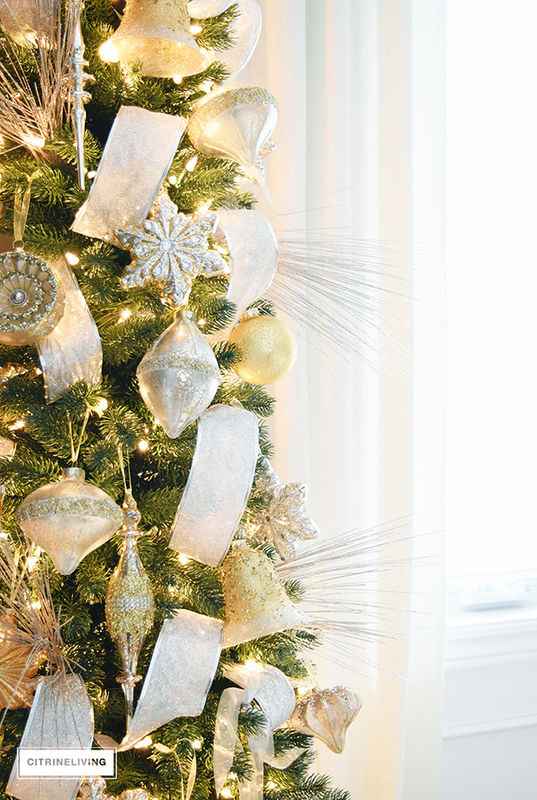 Let’s take a look back at Christmas in our home last year. You can see the full tour here. 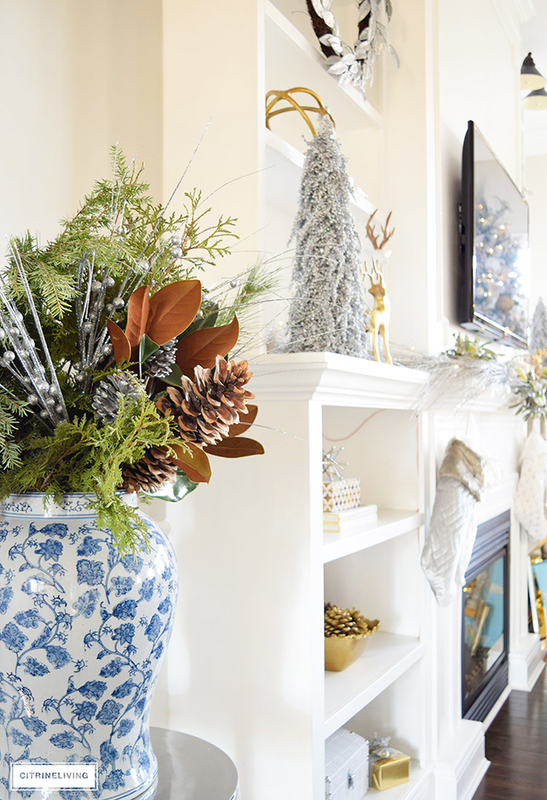 I won’t be changing everything, but I’m determined to find a way to refresh our Christmas decor, just by taking away and adding a few different things. It’s all in the edit! 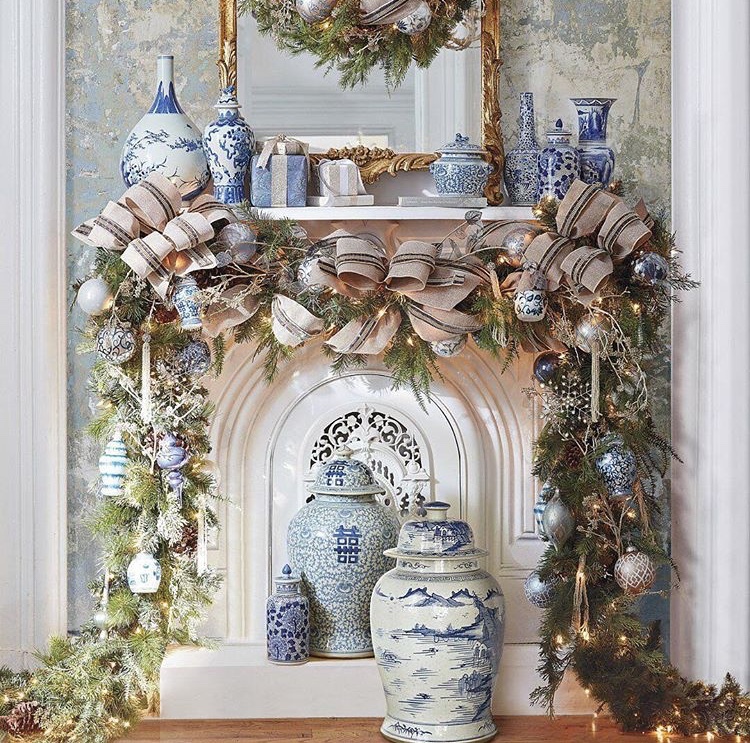 Last year, I only used snippets of my blue and white chinoiserie collection, and this year, I will definitely be keeping much more of it around. 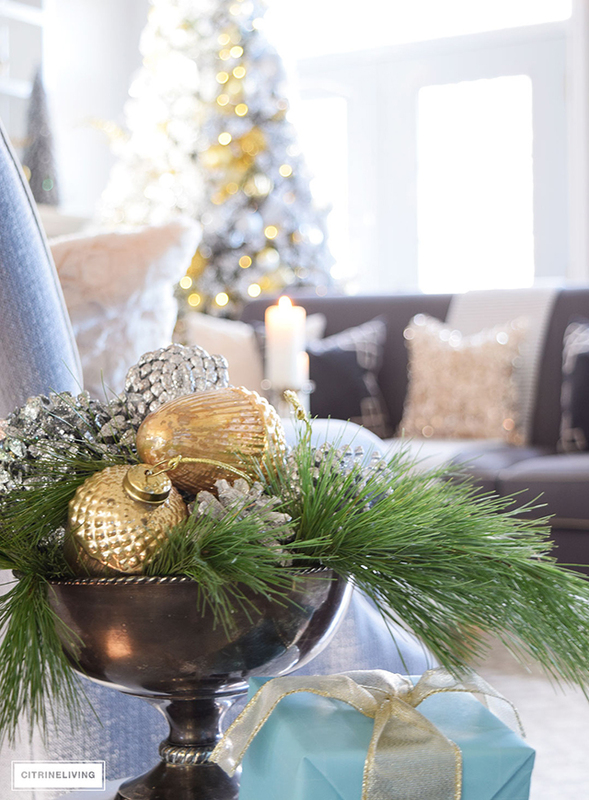 I’ve been using it a lot this past year and I love how gorgeous it pairs with holiday greenery. 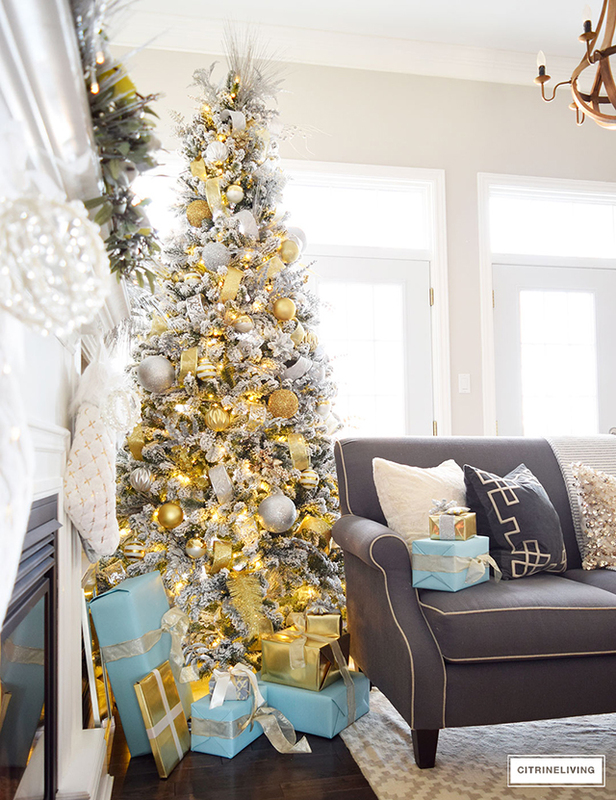 I went full-on metallic throughout our main living area last year, complimented with icy blue accents – don’t worry, I’m still very much keeping my metallics this year! However, I want to bring in a richness, and a more ‘traditional-meets-modern’ look. 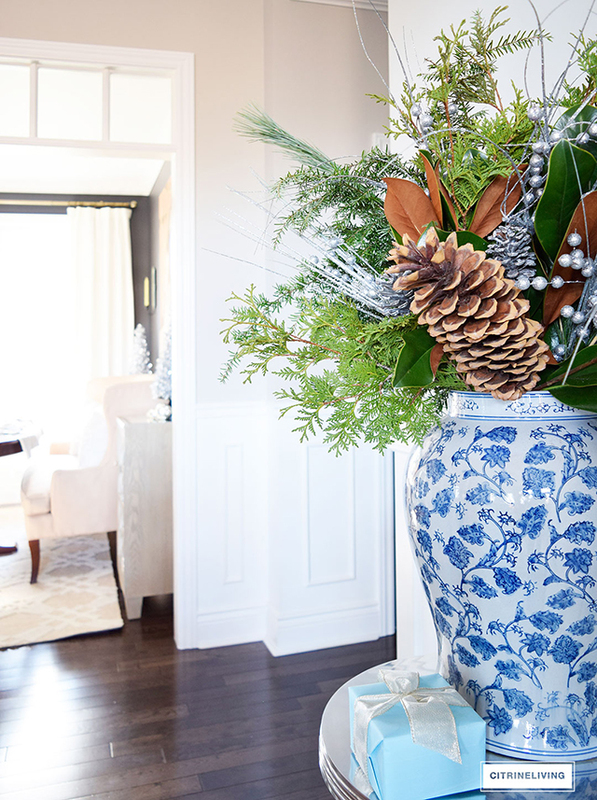 My blue and white collection is growing and I just love to incorporate it throughout our home – it’s timeless and classic, no matter the season! 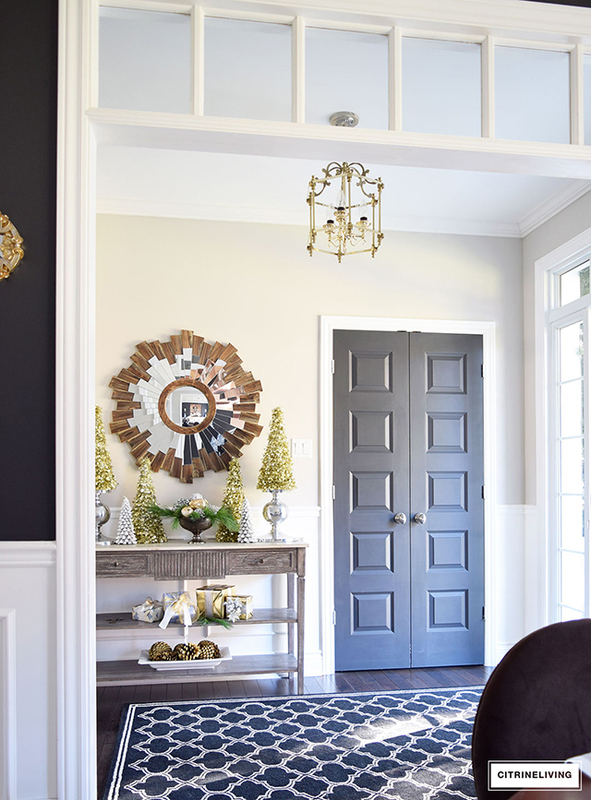 I used mostly neutral metallics in our entryway, dining room and kitchen, with hints of greenery. 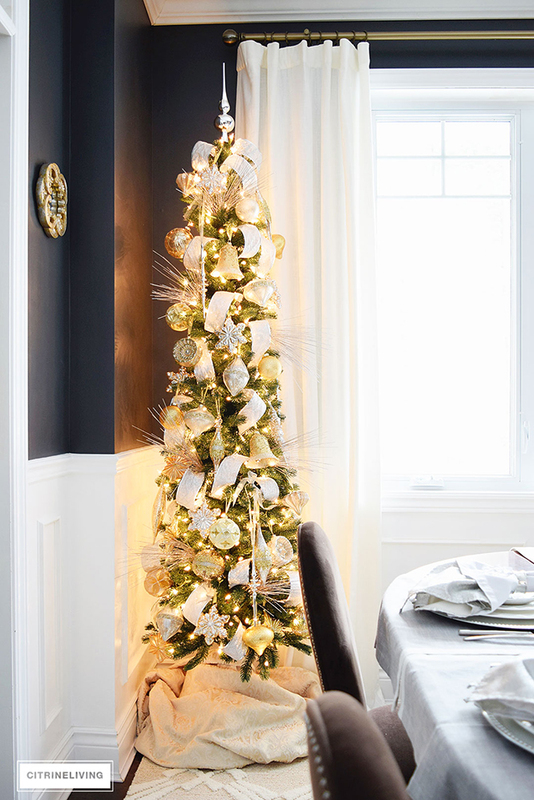 Our dining room is very small, and my Balsam Hill pencil tree was the perfect fit in this corner. 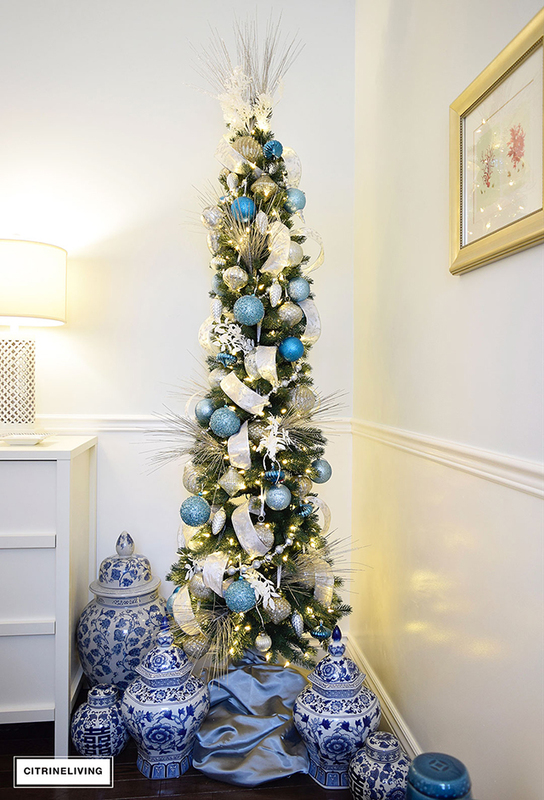 The Balsam Hill glass ornaments are absolutely gorgeous, you can be sure to see these on repeat again, mixed in with some new navy ones. Since I’ve decided to really enjoy the process this season, I can’t wait to open up all of my ornaments from last year and see how it will all come together. I honestly forget what I have sometimes and I love being surprised when I rediscover the beauties that have been packed up for a year! I might be using these two pencil trees on our front porch this year, flanking the front door. I’m excited to try and see how they’ll look! 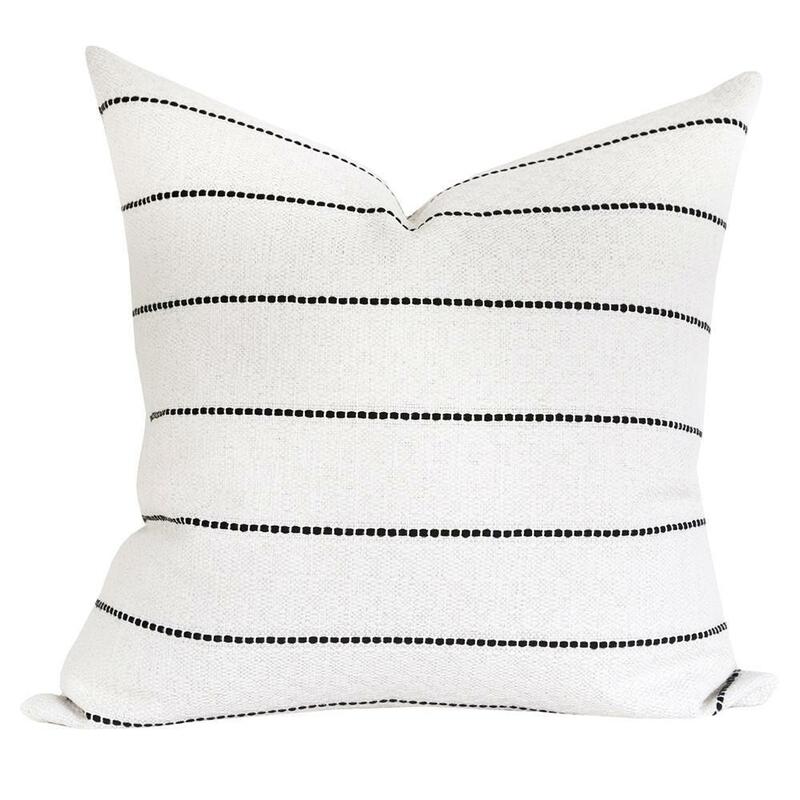 WEEKEND FAVORITES: THE NORDSTROM HALF YEARLY SALE! 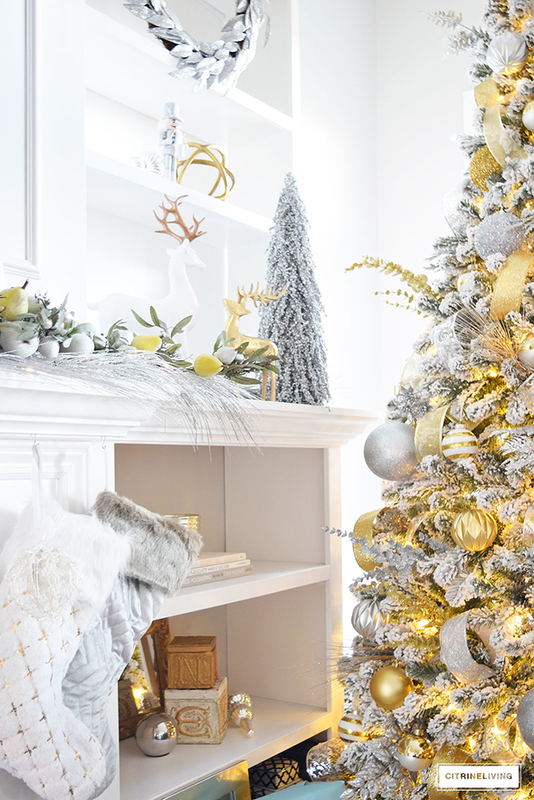 10 Comments on CHRISTMAS DECORATING INSPIRATION AND WISH LIST! 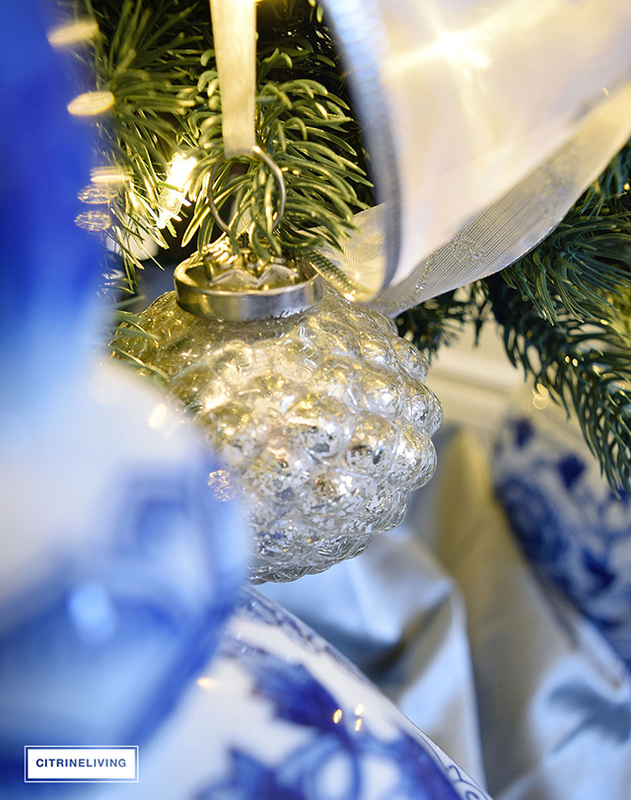 I love your signature blue, especially for Christmas! 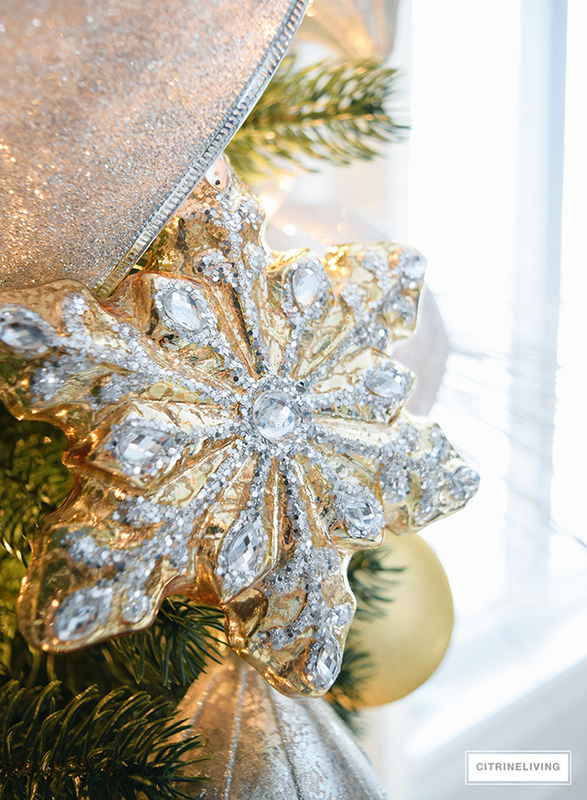 It’s gorgeous with the gold and shimmering touches! Those blue stockings on your inspirational photo are to die for! Can’t wait to see more in the next few weeks! Happy holidays Tamara! Thank you so much!! I’m thrilled you like it all! Aren’t those stockings beautiful? I may splurge and get them! I’m excited to get this all finished and enjoy it!! Oh that makes me so happy! Thank you!! I’m excited to get this all finished!! These hand painted ornements are gorgeous! Thanks for sharing. Can’t wait to see what you do this season!! You are so sweet! Thank you so much, I’m so happy you like it!